July | 2010 | Watts Up With That? July 31, 2010 in Uncategorized. July 31, 2010 in Climate News. July 31, 2010 in Climate News, Technology. July 31, 2010 in Al Gore, Climate News, Politics. In the New York Times: For science that’s accessible but credible, steer clear of polarizing hatefests like atheist or eco-apocalypse blogs. Instead, check out scientificamerican.com, discovermagazine.com and Anthony Watts’s blog, Watts Up With That? Of course, we can’t have that, now the howling begins. Some context below. July 31, 2010 in media, Post-normal science. Graphing Lesson Part 2 – "Crest to Crest"
July 31, 2010 in Climate data. July 30, 2010 in Antarctic, Cosmic rays, Space. July 30, 2010 in Humor. 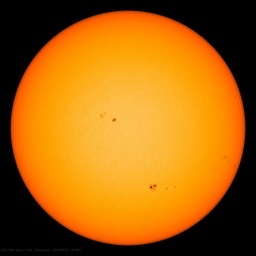 Sunspots at high detail now available from SDO – what will this do to the sunspot count? July 30, 2010 in Science, Solar, Space, Technology. July 30, 2010 in Oceans, Science.